Increasingly, the answer is: they have a chief marketing technologist. A terrific new research report by Laura McLellan of Gartner, How the Presence of a Chief Marketing Technologist Impacts Marketing, confirms that this senior hybrid role — “part strategist, part creative and part technologist” and “broadly the equivalent of a CTO and a CIO dedicated to marketing”— is growing in popularity. Within large companies — more than $500 million in annual revenue — 81% of them now have a chief marketing technologist role, up from 71% just a year ago. Another 8% expect to add that role within the next 24 months. The CMO needs a senior trusted advisor skilled in the art of evaluating and implementing technology-enabled solutions. Who is leading the charge, deciding which technologies to adopt, how they are implemented and at what pace? Even after they are integrated, who will manage their ongoing evolution? Which marketing technology projects should be done in-house, and which through external marketing service providers? They will spend 11.7% of their revenue on marketing, compared with 7.1% for those who don’t. They will spend 30% of their marketing budget on digital marketing, compared with 21% for those who don’t. They will spend 9.8% of their marketing budget on innovation, compared with 5.0% for those who don’t. While correlation is not causation, it’s hard not to see the pattern: companies with marketing technology leadership are investing much more than their peers in marketing — particularly digital marketing — to engage with their customers. If you put your money where your strategy is, these companies clearly view marketing more strategically. Even more interesting, they’re spending nearly 2X as much on innovation in marketing, which includes pilot projects and experimentation with new technologies and techniques. 92% of the companies that have a chief marketing technologist have allocated money from their marketing budget for innovation — as compared to 43% for those who don’t. As you might imagine, I enthusiastically agree. Next Post What if 1,000+ marketing technology vendors were the new normal? There is some comfort for me in learning that such a position is coming into being, if only to give voice to the struggle I face as the single marketing person in a small business. My budget will never allow the addition of such a position, but it does show how overwhelming it can be to know, understand, select, implement and manage all of the available marketing technologies. I’d love to have access to someone with this knowledge on a regular basis! Being a marketing army of one is a challenge these days. On the upside, however, hopefully many of the tools available to you can serve as a “force multiplier” that give you greater reach and capabilities. And, yes, I suspect there will be freelance marketing technologists on the market to help people in a more on-demand fashion. Can’t wait until Business universities worldwide will offer such an MBA major…or dare I say a marketing degree on its own! That would be a seriously fun major. Actually, I teach Digital Marketing & Social Media at Hult International Business School, and just finished working with over 200 Masters in International Marketing students from over 50 countries. Of course, digital is not their only course – they also have to learn about financials, analytics, market research, product / service development and pricing, etc. But it’s a great start to your vision – and it is a Masters degree dedicated to marketing! 1. People from IT who are interested in digital marketing. 2. People from marketing who are interested in software and technology. 3. Web developers and digital entrepreneurs who are typically native to marketing technology. I can’t say that one is always better than another. I’ve seen successes from all of them. It depends a lot on the particular individual and the organization in which they’re operating. This doesn’t really translate to the vast majority of law firms. Today’s CMO and Marketing Director wear many hats, and most are looking to bring more value with what they currently have, not add another high-priced position with a fancy title. I think most small businesses would be hard-pressed to justify a separate role for a chief marketing technologist. (I don’t think the title matters, just the role and its value.) In those cases, having someone on the marketing team who at least carries the responsibility for managing the firm’s marketing technology makes sense though — even if it’s one of many hats. I’ve never heard of this role, but it seems a perfect fit for my background. I don’t see anyone ever advertising for this role. How are they finding and recruiting for it? Or are they mostly growing internally? I certainly don’t believe these figures at all. Gartner mis-judges many sectors maturity through it’s research and this is one. CMT’s are rare beasts and when you do find them, they are often skewed into one stream of the marketing technology platforms. You have to have loads of experience, both in business, technology, marketing and sales to really fulfill this role with any credibility and as yet know and have met only a few. Many global companies I work with are still struggling to realign there businesses and structures to take on board this important role and with the lack of maturity of “marketing platforms” available in this sector, there is much divergence, confusion and disparity all round. Lots more to do, many confused and silted approaches and not helped by the lack of leadership from the agency sectors! David, I certainly agree with you that doing this role really well is a huge challenge — particularly in a large, global company. I did just publish a Q&A with Andreas Starke, effectively the chief marketing technologist at SAP, which gives some great insight into how they approach the role. In defense of Gartner, their study seemed to define the role fairly broadly and doesn’t tie it to a specific title. 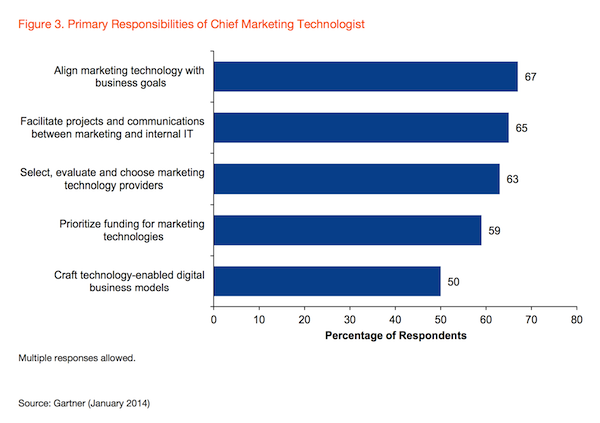 Certainly 81% of large companies don’t have people with the official title of Chief Marketing Technologist. For instance, Andreas is marketing’s Business Information Officer. In some companies, I’ve seen this role absorbed into marketing operations. In others, it’s been a “marketing point person” in IT. My belief is that this role is still emerging, and so many different companies have people playing this part either officially or unofficially under a wide range of charters. We certainly have a long way to go, for many of the reasons you point out. But hopefully we’ll start to bring to light more of the best practices of organizations that are making it work. If you find examples of companies who you think are doing a terrific job, I’d love to hear about them! Finally the Marketing team has caught on that they need technology and not more spreadsheets. I am a marketing technologist and understand the value that we as a profession bring to the table. Sure its lead generation, quality of leads but its also proper content and metrics and measurements. It is also about CRM integration and a sales driven agenda not just marketing’s efforts for “best in show awards”. We did a trade show and the marketing girl was so excited that she gave a GPS away that she threw away the fishbowl with all the leads when she was tearing the booth down. Now to be fair to her, the previous trade show the leads went to a bunch of sales people that never made any calls to the prospects. Technology would have caught that very quickly.